The Aromatherapy is a thousand year-old techniques that benefits from a considerable fame in both medical and cosmetic fields. The secret of the current growth and the success of essential oils are due to two main factors. Physical. Because their molecule is complex, essential oils are used in many therapeutic applications. Since they contain from 50 to 500 different chemical substances, essential oils are chemically rich and have numerous medical properties. Essential oils can dilate or contract blood vessels, can be used to relax or stimulate the body, or have beneficial effects on kidneys, ovaries, the thyroid, or the digestive process. Emotional. 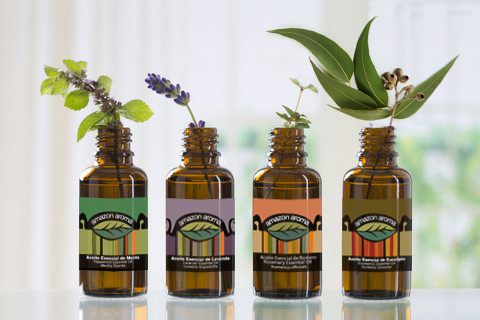 The aromas that come from essential oils have relaxing and positive effects on both body and mind. The perception of the smell goes straight to the hypothalamus, which is the main regulator of the body activities. In this very part of the brain are also located the learning center, the memory, and emotions. That’s why it is normal that the aromas that we perceive can automatically trigger rare emotions and forgotten moments of life. While buying an essential oil, you need to read the label to make sure whether the oil comes from a natural/organic or an artificial essence. The ideal oil to elaborate perfumes, oils for therapeutic massage or simply to practice aromatherapeutic methods, is 100% pure oil. In what conditions should essential oils be used? Aromatic bath: With 5 to 6 drops of a mix of essential oil and the hot bath water in order to reduce stress or to heal serious skin problems. Massage: Mix a big tablespoon of diluted oil such as sunflower, with 5 drops of a selected essential oil. Apply on the skin with a soft massage. Vaporizations or inhalations: In a saucepan filled with water, pour 4 drops of essential oil and warm up at a low temperature. The essential oil will diffuse its perfume in the air, and create an aromatized ambiance. Another method is to pour in a water-boiling saucepan 4 drops of a mix of oils especially selected by the person under treatment; this person should wrap his/her head with a towel and inhale the healing vapors with the nose. This is an excellent method to cure health problems such as sinusitis, nasal congestion and headaches. This treatment also enables to take care of the face skin. Hot or cold compresses: Add from 3 to 5 drops of a mix of selected essential oils to a damp (or wet) towel. The temperature depends on the type of health trouble to cure.